A group of children enjoy a cup of yogurt topped with a variety of toppings at the You say When Yogurt Shoppe in FishHawk. The shop opened early last year and lives up to its reputation of serving up tasty treats while promoting an active and healthy lifestyle in the community. With a love for healthier choice of sweet treats, families made regular visits to the You Say When Yogurt Shoppe at the Brandon mall, wishing that one could be closer to home. It was only a matter of time before FishHawk residents Juli Lewis and her husband T.J., took matters into their own hands. “I try to stress the importance of an active and healthy lifestyle to my family and said that we needed one of the You Say When Yogurt Shoppe in FishHawk, since we had nothing like it in the area,” Juli said. Her expressions in earshot of a local franchisor did not go unnoticed, especially since such a request was often heard from other like minded frozen yogurt lovers. Fitting the necessity of finding the right owners for a shop in FishHawk, in January of 2011 Julie and T.J opened the approximately 1,800 sq. foot yogurt parlor located inside the FishHawk Publix Plaza at 5614 FishHawk Crossing Blvd. in Lithia. “My husband and I already had full-time jobs, had never owned a business and were not big risk takers, but we just had a good feeling about it so we decided to give it a shot,” Juli said. Today the business is doing great and the seven-member staff is learning as they go. The staff values customer feedback and customers get to choose from a variety of frozen yogurt flavors topped with all the toppings they like. “We want to make the shop a fun family place that doesn’t have to be considered a luxury,” T.J. said. Flavors change just about every season but the regulars include French vanilla, Hershey kiss chocolate, pomegranate, cake batter and cookies and cream, which according to Julie is a favorite for the kids while pomegranate, at only 8 calories per ounce, is a favorite for the health conscious. 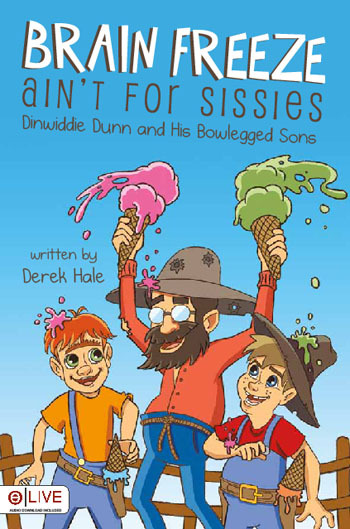 Fittingly, and to live up to their community involvement, the shop will welcome author Derek Hale to promote his recent children’s book entitled ‘Brain Freeze Ain’t for Sissies’ Dinwiddie Dunn and His Bowlegged Sons, scheduled for Saturday, April 21, from 1-3 p.m.
Hale, who lives in Brandon with his wife LeEllen and his cat, Tabitha, began the Dinwiddie Dunn and his Bowlegged Sons series about 15 years ago, as stories for his children. The 28-page paperback book is sold for $9.99 and is published by Tate Publishing & Enterprises, LLC, a Christian-based, family-owned, mainline publishing organization with a mission to discover and market unknown authors. To sweeten the deal, Juli promises a free kiddie cup with purchase of the book for anyone who comes by during the signing. As for upcoming events, the shop hosts many spirit days where 10 percent of the day’s totals is given to charity. ‘Move it Mondays’ are also held every Monday evening at 6:30 p.m., where participants meet up and walk, jog or run a three-mile course mapped out within FishHawk to encourage family time and healthy activity. You Say When Yogurt is open Monday-Thursday 12 p.m.-9 p.m., Friday and Saturday 12 p.m.-10 p.m., and Sunday 12 p.m.-8 p.m.
For more information please call the shoppe at 653-9819. For information about Derek Hale please visit www.dinwiddiedunn.com.